Please sign up by October 25th! ​$35/per person after October 25th! *There is a minimum of 10 participants required to sign up by 10/25 for this event to happen! Please email us at gativisions@gmail.com if you are interested in signing up!! Originally from Nepal, Sadikshya is now party of the Blue Ridge Women in Agricultural. Thomas Cooper is a passionate herbalists. Jeremiah Brown is an individual with a vision and a quest. He is a musician, yoga instructor, artist, father, organic farmer, builder, and a sound healer. 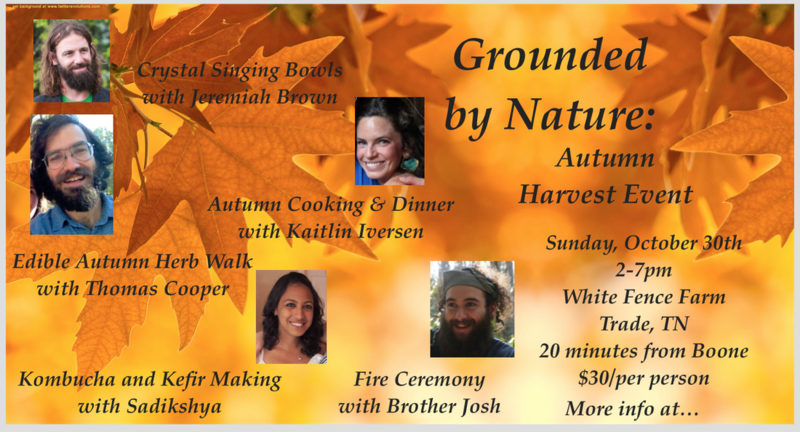 Jeremiah also hosts community festivals where he introduces people from all over to the concept of sound healing by creating a human mandala and plays the crystal singing bowls. Vibrational healing is an ancient technique that is used to create space around each of the cells within the body. If an organ is 'out of tune' or there is any lethargy in the body- the vibrations created by the singing bowls will literally 'tune you' back to health. Kaitlin Iversen is an event coordinator, yoga instructor, organic farmer, animal enthusiast and passionate community member. She has traveled extensively around the globe and gathered integral knowledge on how to live a healthful life style. Kaitlin believes that a healthy mind, body and spirit and a strong sense of community are some of the most beautiful and important aspects to life. It’s EASY! Just one turn! Only 14 miles from Downtown Boone NC! From Boone: Take HWY. 421 North about 17 miles until you see the entrance sign on the left immediately after a large orange metal antiques building. Take the left onto Paul McGlamery Ln. and you will dead end into the farm 100 yards from the highway. Hope to see you at this wonderful event!